Pectoral Sandpiper: Medium sandpiper with scaled, dark brown upperparts, heavily streaked brown breast, plain white belly and eyering. Crown is dark brown. Faint wing-bar and black rump with white edges are visible in flight. Swift direct flight with rapid wing beats. Zigzag pattern when flushed. 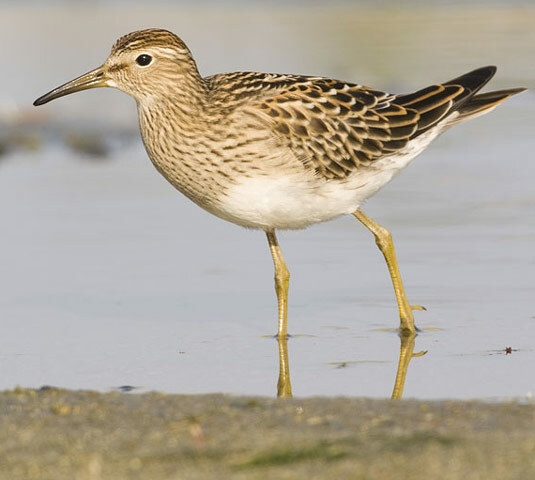 Pectoral Sandpiper: Breeds on arctic tundra from Alaska to Hudson Bay; also found in Siberia. Spends winters in South America. Preferred habitats include marshes and grassy pools. The breeding male Pectoral Sandpiper has an inflatable throat sac, which expands and contracts rhythmically during display flights. The accompanying vocalization consists of a series of hollow hoots. They are promiscuous: males mate with multiple females, and females mate with multiple males. They were once known as the Grass Snipe and the Krieker. Cox’s Sandpiper is a hybrid between this species and the Curlew Sandpiper. The Pectoral Sandpiper has a tremendous range extending between 1,000,000 to 10,000,000 square kilometers. This bird can be found in an expansive number of locations including the continents of Asia, Australia, North America, much of South America, the Caribbean and has vagrant populations in the Middle East, Africa and Antarctica. Its preferred habitat ranges from grasslands, wetlands, marine and coastal locations. The global population of this bird is estimated to be around 25,000 to 100,000 individual birds. Currently, it is not believed that the population trends for this species will soon approach the minimum levels that could suggest a potential decline in population. Due to this, population trends for the Pectoral Sandpiper have a present evaluation level of Least Concern.